Mammography (also called mastography) is the process of using low-energy X-rays (usually around 30 kVp) to examine the human breast, which is used as a diagnostic and screening tool. The goal of mammography is the early detection of breast cancer, typically through detection of characteristic masses and/or microcalcifications. Like all X-rays, mammograms use doses of ionizing radiation to create images. These images are then analyzed for any abnormal findings. It is normal to use lower-energy X-rays, typically Mo (K-shell x-ray energies of 17.5 and 19.6 keV) and Rh (20.2 and 22.7 keV) than those used for radiography of bones. Ultrasound, ductography, positron emission mammography (PEM), and magnetic resonance imaging (MRI) are adjuncts to mammography. Ultrasound is typically used for further evaluation of masses found on mammography or palpable masses not seen on mammograms. MRI can be useful for further evaluation of questionable findings as well as for screening pre-surgical evaluation in patients with known breast cancer to detect any additional lesions that might change the surgical approach, for instance from breast-conserving lumpectomy to mastectomy. All women over the age of 40 should have an annual mammogram. Ultrasound is used in many cases as an additional examination to determine the nature of abnormalities detected on mammography or for added information in those women who have very dense breast tissue. 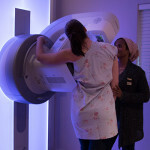 There is no evidence that mammography itself is dangerous or can produce cancer. One stop comprehensive breast imaging including full field digital mammography (FFDM), digital breast tomosynthesis (DBT) and high resolution ultrasound. Minimally invasive breast interventional procedures, including FNAB and vacuum assisted breast biopsy (VABB) on an outpatient basis. Affiliation with RSSA breast imaging subgroup (BISSA). For more information, or to make a booking, please contact Winelands Radiology at 021 851 5545.